Coconut | Become Healthy or Extinct! Coconut and coconut oil has been maligned for a long time, not by its users but by the producers of competing oils. The main aim of these producers was to only promote and sell oils made from sources that were abundantly available in their home countries, to maximize profits of course. 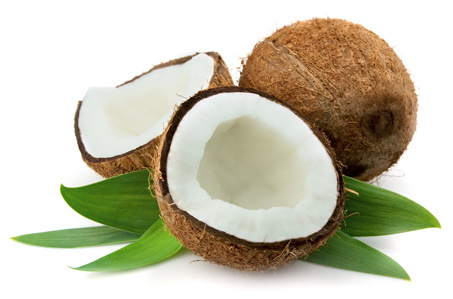 In truth, coconut is one of the most wondrous trees on earth that amply provides for so many human needs. In coconut growing countries, not a single part of the coconut tree goes to waste. Considered one of the most treasured foods of all time, coconut products including coconut flesh, coconut water, coconut oil, and coconut cream each deliver amazing health benefits. Few people and even fewer doctors understand that the coconut helps in stabilizing blood sugar; lowering cholesterol; hydrating the body; improving cardiovascular health, improving digestion, regulating hormones, supporting thyroid function, improving bone health, increasing metabolism, increasing immunity and aiding weight loss. In ancient India, the coconut palm has been recognized as a top immune booster, antifungal, antibiotic, antiviral and antibacterial remedy for thousands of years. Yet, it is only recently that modern researchers have begun to fully discover the massive health benefits this amazing fruit seed offers. Coconut oil is considered the best and safest oil to use for cooking and even superior to extra virgin olive oil when it comes to giving the body what it needs for optimum health. Unlike other fats and oils that we typically use for cooking and baking, because of its stable molecular structure, coconut oil does not break down into toxic byproducts when cooked. It does not form polymerized oils or dangerous trans fatty acids in our bodies, which raise our cholesterol levels; clog our arteries and even make our skin sag and wrinkle. Polyunsaturated oils, which include vegetable oils like corn, soy, safflower and canola, can be very bad for health because they tend to become easily oxidized or rancid when exposed to heat from cooking. This results in the formation of molecules more toxic than trans fat, such as cyclized, cross-linked, fragmented bond-shifted and polymerized damaged oil molecules that stick in the body for years and wreck havoc on its health. 50% of the fat content in coconut oil is a fat rarely found in nature called lauric acid. The body converts lauric acid into monolaurin, which has anti-viral, anti-bacterial and anti-protozoa properties. Monolaurin is a monoglyceride, which can actually destroy lipid-coated viruses such as HIV, herpes, cytomegalovirus, hepatitis, measles, influenza, various pathogenic bacteria like listeria monocytogenes and helicobacter pylori and protozoa such as giardia lamblia. Lauric acid is a powerful virus and gram-negative bacteria destroyer, and coconut oil contains the most lauric acid than any other thing on earth. Capric acid and caprylic acid, which are also fatty acids present in smaller amounts, account for the antimicrobial action of coconuts. Coconut oil can give the body important antioxidants that can help build stronger cells and improve overall health and well-being. So, switching to coconut oil for all of your frying needs and adding grated coconut to some of your food recipes like the people in costal zones would be one of the smartest cooking moves you could ever make. Coconut oil is very stable and does not go rancid for up to 3 years, even when stored at room temperature. What is more is that it is highly alkaline. Perhaps the greatest advantage of coconut oil is that it goes directly to the liver where it is metabolized like a carbohydrate and gets converted into energy, not like the other oils which get stored as fat in the body. So in truth, it is a nutrient and gives you energy. Simply rubbing a little fresh coconut oil on your gums and teeth can keep them stronger and healthier than virtually any other dental treatment by protecting your teeth from bacteria. The best coconut oil you can use is the organic cold pressed unrefined variety because the liver easily digests this type of oil. Coconut oil also makes superb topical oil that can help to naturally rid the skin of dangerous toxins. It also gives the skin the perfect mix of hydration and antioxidants that it needs to stay healthy, smooth and younger looking. Unlike traditional skin creams which can actually introduce fats and oils to the skin that will break it down over time, making it look older, creams derived from the coconut can actually replenish the skin, giving it a more youthful and healthy glow than most other skin care products on the market. Coconut oil is not only a good moisturizer for the scalp that nourishes hair roots thereby preventing hair fall, it also keeps the scalp free from bacterial and fungal growth. It is also effective in treating various skin problems like psoriasis, dermatitis and eczema. Could you frankly ask for more than this from an oil? Coconut water is completely pure and sterile and has the highest concentration of electrolytes compared to anything else found in nature, which is why it is an excellent source of hydration. Coconut water contains vitamins, minerals, amino acids, carbohydrates, antioxidants, enzymes, health enhancing growth hormones, and other phytonutrients. It has even been used in hospitals in I.V fluid for premature babies and the extremely ill to replace blood plasma in an emergency. Direct oral consumption of coconut oil is also recommended for people who have intestinal fungal growth like candida, or external fungus like clamidia and eczema. It is a powerful antiviral because it dissolves the oil-based cell wall of viruses destroying them on the spot. You can have as much as two tablespoons of coconut oil twice a day as a therapeutic dose to kill excessive yeast, although you may need to work your way up to that amount. If you are getting up to four tablespoons from your fried food daily, that should suffice too. Many vegetarians or vegans have dangerously low cholesterol levels. They can very effectively use coconut oil to increase their cholesterol levels. Even if one already has high cholesterol levels, taking only very large quantities can be harmful. Many populations across the world, who consume a lot of saturated coconut oil, have all shown nearly non-existent rates of cardiovascular disease. Those eating diets high in coconut products are healthy and trim, despite the high fat concentration in their diet, and do not suffer from heart disease. Thank you Darryl, and I had been blaming my coconut chutney for my high cholesterol.